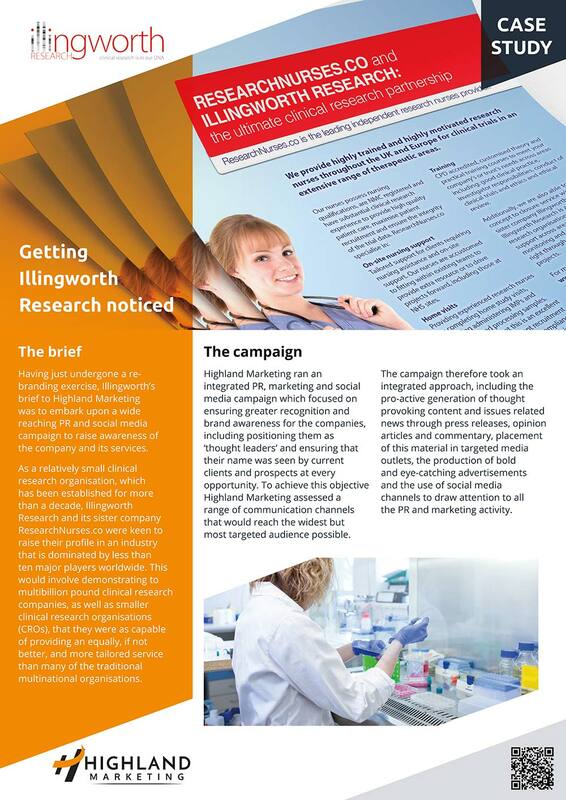 Read about some of our successful client campaigns and results delivered. 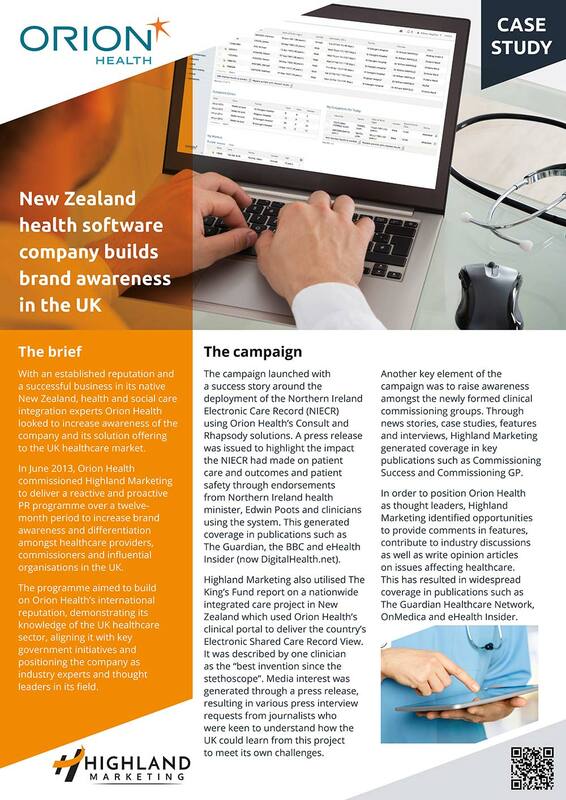 US corporation CSC wanted to raise awareness of its healthcare solutions offering across the EMEA region, with a specific focus on the Nordics and Middle East. 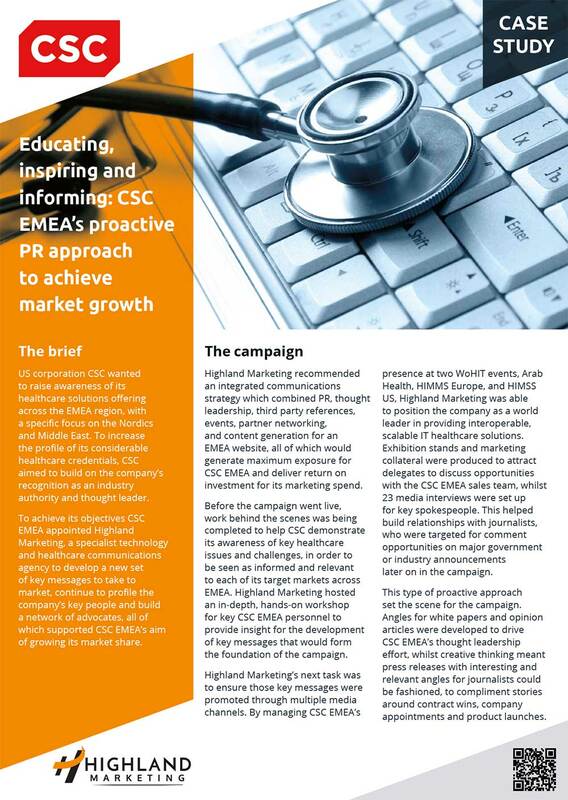 To increase the profile of its considerable healthcare credentials, CSC aimed to build on the company’s recognition as an industry authority and thought leader. 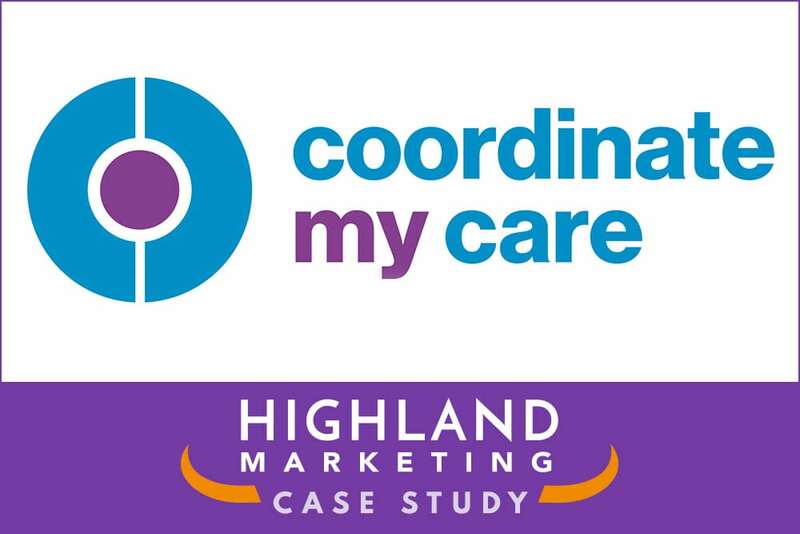 As part of a long and ongoing relationship with IMS MAXIMS, an electronic patient record (EPR) and patient administration system (PAS) provider, Highland Marketing was asked to assist in the launch of openMAXIMS, an open source version of the company’s well–established MAXIMS solution set. 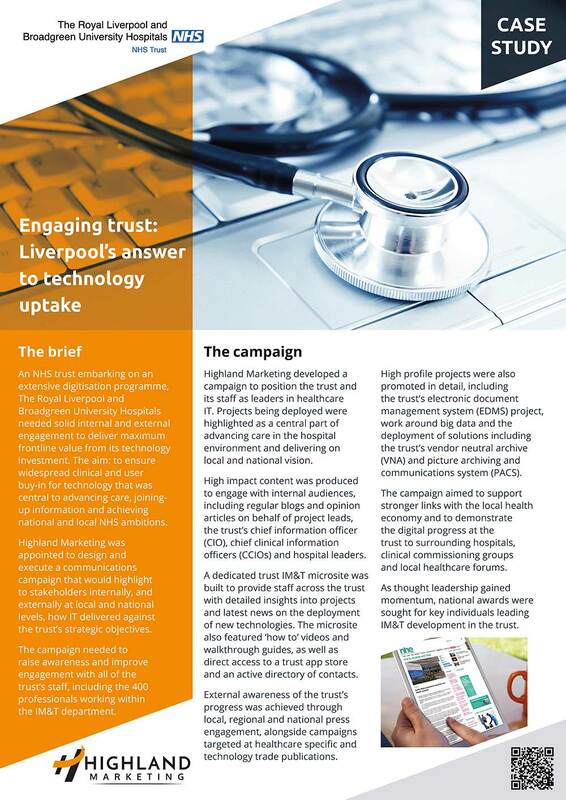 An NHS trust embarking on an extensive digitisation programme, The Royal Liverpool and Broadgreen University Hospitals needed solid internal and external engagement to deliver maximum frontline value from its technology investment. 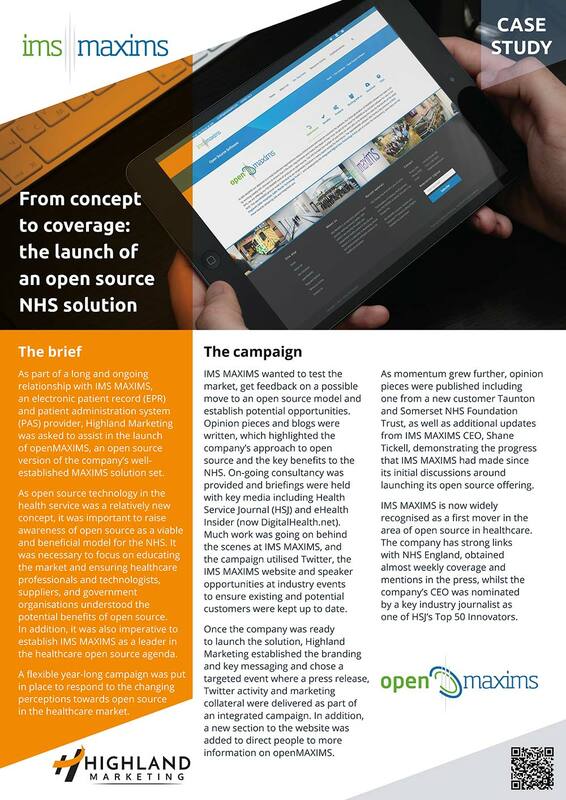 The aim: to ensure widespread clinical and user buy-in for technology that was central to advancing care, joining-up information and achieving national and local NHS ambitions. 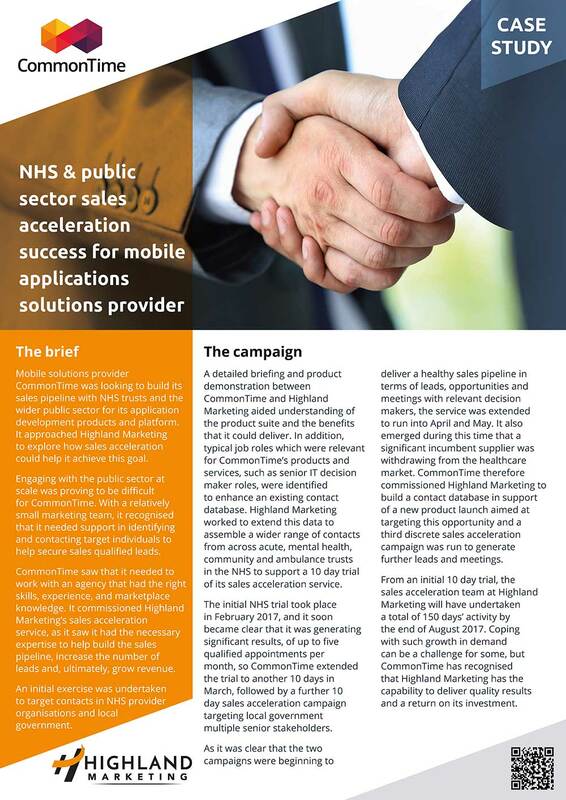 Mobile solutions provider CommonTime was looking to build its sales pipeline with NHS trusts and the wider public sector for its application development products and platform. 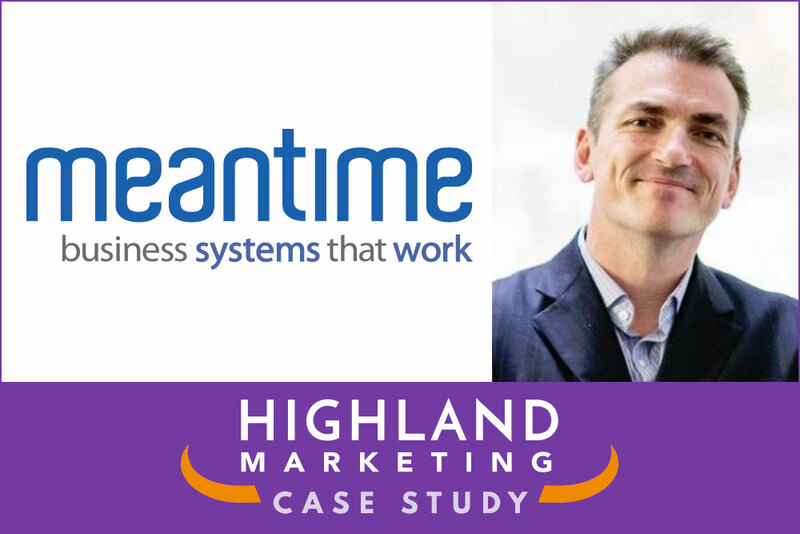 It approached Highland Marketing to explore how sales acceleration could help it achieve this goal. 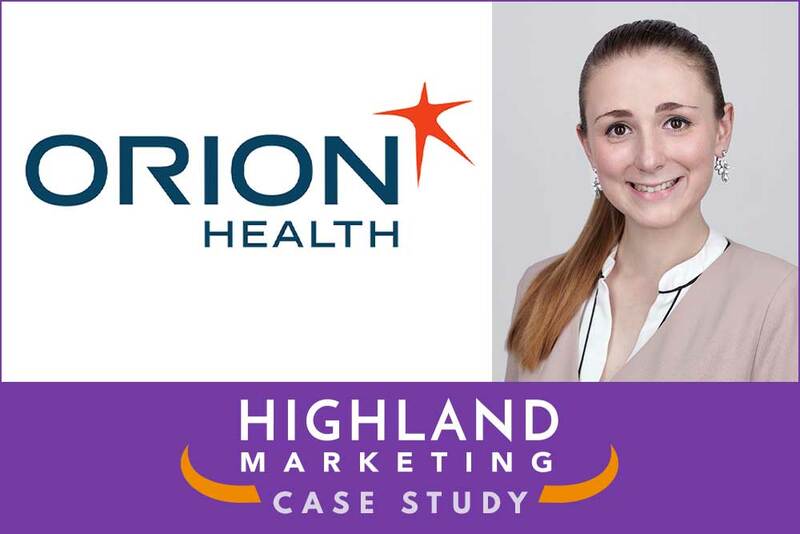 With an established reputation and a successful business in its native New Zealand, health and social care integration experts Orion Health looked to increase awareness of the company and its solution offering to the UK healthcare market. 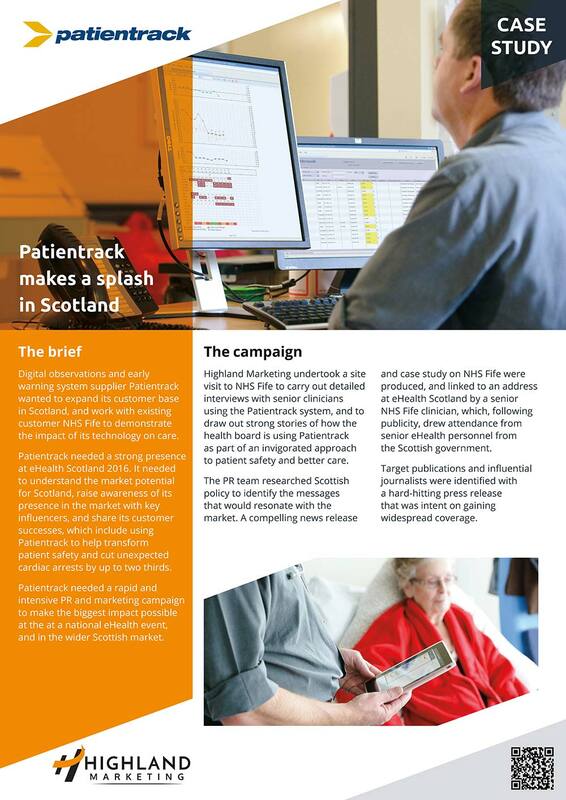 Digital observations and early warning system supplier Patientrack wanted to expand its customer base in Scotland, and work with existing customer NHS Fife to demonstrate the impact of its technology on care. 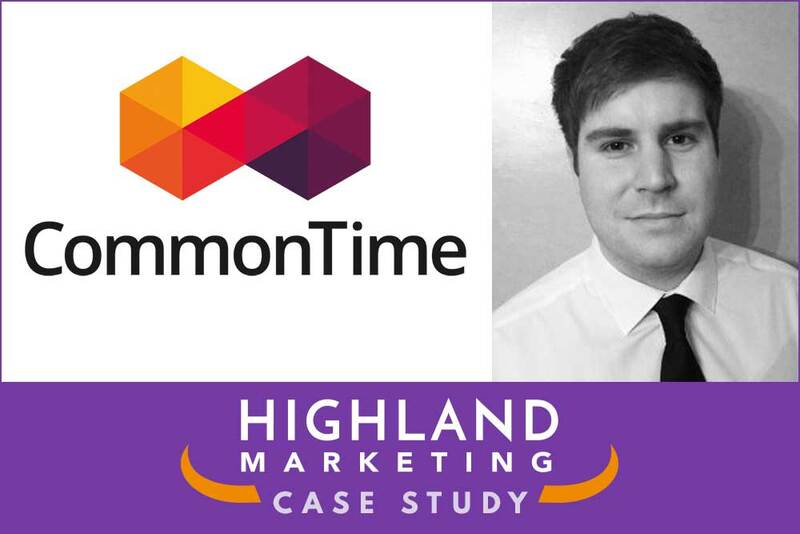 Having just undergone a rebranding exercise, Illingworth’s brief to Highland Marketing was to embark upon a wide reaching PR and social media campaign to raise awareness of the company and its services. 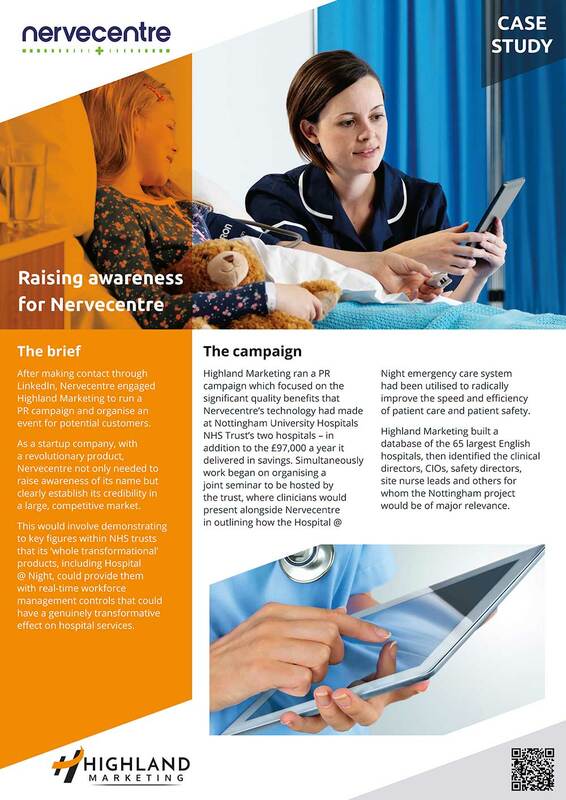 As a startup company, with a revolutionary product, Nervecentre not only needed to raise awareness of its name but clearly establish its credibility in a large, competitive market. 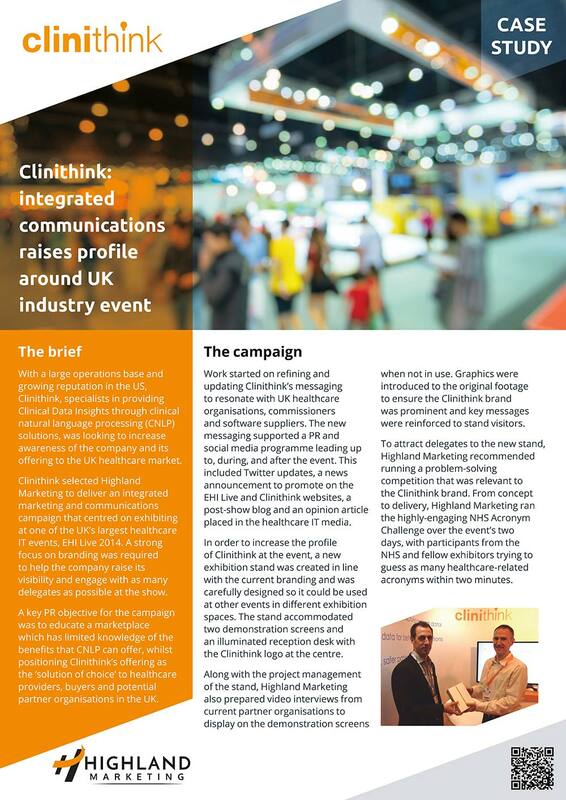 With a large operations base and growing reputation in the US, Clinithink, specialists in providing Clinical Data Insights through clinical natural language processing (CNLP) solutions, was looking to increase awareness of the company and its offering to the UK healthcare market. 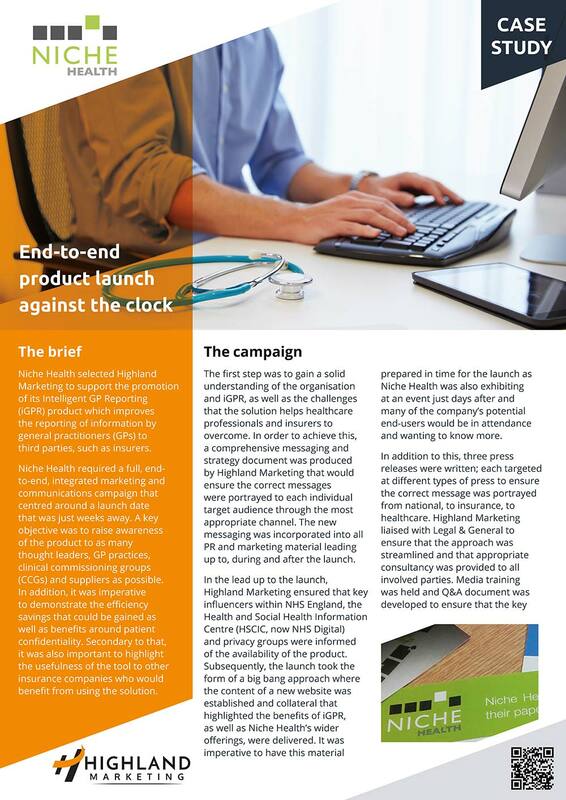 Niche Health selected Highland Marketing to support the promotion of its Intelligent GP Reporting (iGPR) product which improves the reporting of information by general practitioners (GPs) to third parties, such as insurers.